This is an extended quote from Viktor Frankl on the limitations of "reductionism" – what might be called the tendency to reduce human behavior to "nothing but ___" (insert whatever lens you want, biology, physics, evolutionary psychology, etc.). I love his analogy in the figures below. This is kind of a wordy quote from this book, but overall I find Frankl to be a very clear writer. If you want to go a little beyond his famous Man's Search for Meaning, this would be a great next book to read. To me, Frankl still the most clear and straightforward psychologist who works from a generally spiritual worldview. ...Let us ask what may have caused reductionism. To answer this question we must consider the effects of scientific specialization. We are living in an age of specialists, and this takes its toll. I would define a specialist as a man who no longer sees the forest of truth for the trees of facts. To choose one example, in the field of schizophrenia, we are confronted with a lot of findings furnished by biochemistry. We are also facing a vast literature on the hypothetical psychodynamics underlying schizophrenia. And another literature is concerned with the uniquely schizophrenic mode of being in the world. However, I deem that he who contends that he knows what schizophrenia really is is deceiving you, or at best himself. The pictures by which the individual sciences depict reality have become so disparate, so different from each other, that it has become more and more difficult to obtain a fusion of the different pictures. The difference between pictures need not constitute a loss, but may well form a gain in knowledge. In the case of stereoscopic vision, it is the very difference between the right and the left picture that makes for the acquisition of a whole dimension, that is, the three-dimensional space over against the two-dimensional plane. To be sure, there is a precondition. The retinas must be capable of arriving at a fusion of the different pictures! What holds for vision is also true of cognition. The challenge is how to attain, how to maintain, and how to restore a unified concept of man in the face of the scattered data, facts, and findings supplied by a compartmentalized science of man. But we cannot draw back the wheel of history. Society cannot do without specialists. Too much of the style of research has become characterized by teamwork, and in the framework of teamwork the specialist is indispensable. But does the danger really lie in the lack of universality? Doesn’t it rather lurk in the pretense of totality? What is dangerous is the attempt of a man who is an expert, say, in the field of biology, to understand and explain human beings exclusively in terms of biology. The same is true of psychology and sociology as well. At the moment at which totality is claimed, biology becomes biologism, psychology becomes psychologism, and sociology becomes sociologism. In other words, at that moment science is turned into ideology. What we have to deplore, I would say, is not that scientists are specializing but that the specialists are generalizing. We are familiar with that type called terrible simplificateurs. Now we become acquainted with a type I would like to call terrible généralisateurs. I mean those who cannot resist the temptation to make overgeneralized statements on the grounds of limited findings. I once came across a quotation defining man as “nothing but a complex biochemical mechanism powered by a combustion system which energizes computers with prodigious storage facilities for retaining encoded information.” Now, as a neurologist, I stand for the justification of using the computer as a model, say, for the activity of the central nervous system. It is perfectly legitimate to use such an analogy. Thus, in a certain sense the statement is valid: man is a computer. However, at the same time he also is infinitely more than a computer. The statement is erroneous only insofar as man is defined as “nothing but” a computer. Today nihilism no longer unmasks itself by speaking of “nothingness.” Today nihilism is masked by speaking of the “nothing-but-ness” of man. Reductionism has become the mask of nihilism. How should we cope with this state of affairs? How is it possible to preserve the humanness of man in the face of reductionism? In the final analysis, how is it possible to preserve the oneness of man in the face of the pluralism of sciences, when the pluralism of sciences is the nourishing soil on which reductionism is flourishing? Nicolai Hartmann and Max Scheler, perhaps more than anyone else, have tried to solve the problem confronting us. Hartmann’s ontology and Scheler’s anthropology are attempts to allot to each science a province of limited validity. Hartmann distinguished various strata such as the bodily and mental ones plus a spiritual apex. Here again spiritual is meant without a religious connotation, but rather in the sense of noological. Hartmann sees the stratification of human existence as a hierarchical structure. By contrast, Scheler’s anthropology uses the image of layers (Schichten) rather than strata (Stufen), thereby distinguishing the more or less peripheral biological and psychological layers from the central personal one—the spiritual axis. Certainly both Hartmann and Scheler have done justice to the ontological differences between body, mind, and spirit by conceiving of them in terms of qualitative rather than merely quantitative differences. However, they do not take into sufficient account what is opposed to the ontological differences, namely, what I would like to call the anthropological unity on the other hand. Or, as Thomas Aquinas put it, man is a “unitas multiplex.” Art has been defined as unity in diversity. I would define man as unity in spite of multiplicity! Conceiving of man in terms of bodily, mental, and spiritual strata or layers means dealing with him as if his somatic, psychic, and noetic modes of being could be separated from each other. I myself have tried simultaneously to do justice to the ontological differences and the anthropological unity by what I have called dimensional anthropology and ontology. This approach makes use of the geometrical concept of dimensions as an analogy for qualitative differences which do not destroy the unity of a structure. Dimensional ontology as I have propounded it, rests on two laws. The first law of dimensional ontology reads: One and the same phenomenon projected out of its own dimension into different dimensions lower than its own is depicted in such a way that the individual pictures contradict one another. Imagine a cylinder, say, a cup. 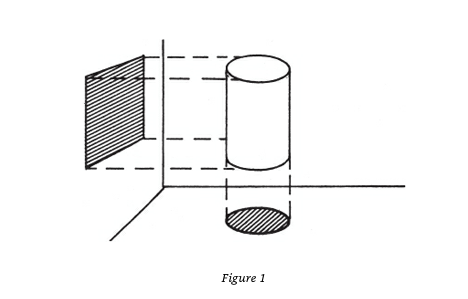 Projected out of its three-dimensional space into the horizontal and vertical two-dimensional planes, it yields in the first case a circle and in the second one a rectangle. These pictures contradict one another. What is even more important, the cup is an open vessel in contrast to the circle and the rectangle which are closed figures. Another contradiction! Now let us proceed to the second law of dimensional ontology which reads: Different phenomena projected out of their own dimension into one dimension lower than their own are depicted in such a manner that the pictures are ambiguous. Imagine a cylinder, a cone, and a sphere. The shadows they cast upon the horizontal plane depict them as three circles which are interchangeable. We cannot infer from a shadow what casts it, what is above it, whether a cylinder, a cone, or a sphere. According to the first law of dimensional ontology, the projection of a phenomenon into different lower dimensions results in inconsistencies, and according to the second law of dimensional ontology, the projection of different phenomena into a lower dimension results in isomorphies. Now how should we apply these images to anthropology and ontology? Once we have projected man into the biological and psychological dimensions we also obtain contradictory results. For in the one case a biological organism is the result; in the other one, a psychological mechanism. But, however the bodily and mental aspects of human existence might contradict one another, seen in the light of dimensional anthropology this contradiction no longer contradicts the oneness of man. Or does the contradiction between a circle and a rectangle contradict the fact that both result from a projection of the same cylinder? Dimensional ontology is far from solving the mind-body problem. But it does explain why the mind-body problem cannot be solved. Of necessity the unity of man—a unity in spite of the multiplicity of body and mind—cannot be found in the biological or psychological but must be sought in that noological dimension out of which man is projected in the first place. However, alongside the problem of mind versus body, there is the problem of determinism, the problem of freedom of choice. But this problem, too, may well be approached along the lines of dimensional anthropology. The openness of a cup necessarily disappears in the horizontal and vertical dimensions. Well, man, too, projected into a dimension lower than his own seems to be a closed system, be it of physiological reflexes or psychological reactions and responses to stimuli. Those motivational theories, e.g., which still adhere to the homeostasis principle, deal with man as with a closed system. This, however, means disregarding and neglecting that essential openness of human existence which has been evidenced by Max Scheler, Adolf Portmann, and Arnold Gehlen. Particularly the biologist Portmann and the sociologist Gehlen have shown us that man is open to the world. Because of the self-transcendent quality of human existence, I would say, being human always means being directed and pointing to something or someone other than itself. All this disappears in the biological and psychological dimensions. But in the light of dimensional anthropology we can at least understand why this must happen. Now the apparent closedness of man in the biological and psychological dimensions no longer contradicts the humanness of man. Closedness in the lower dimensions is very compatible with openness in a higher one, be it the openness of a cylindrical cup, or that of a human being." "...being human always points, and is directed, to something, or someone, other than oneself, be it a meaning to fulfill or another human being to encounter. The more one forgets himself, by giving himself to a cause to serve or another person to love, the more human he is and the more he actualizes himself. What is called self-actualization is not an attainable aim at all, for the simple reason that the more one would strive for it, the more he would miss it. In other words, self-actualization is possible only as a side-effect of self-transcendence." "In an age in which the Ten Commandments seem to lose their unconditional validity, man must learn more than ever to listen to the ten thousand commandments arising from the ten thousand unique situations of which his life consists." 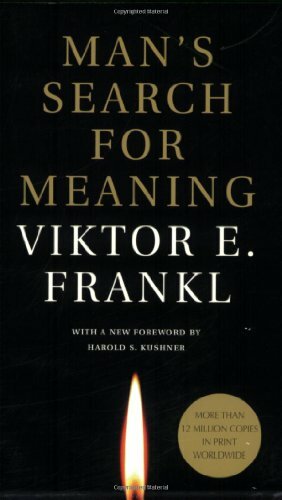 Viktor Frankl believed that, beyond anything else, human beings crave meaning. We can endure any what, he thought, as long as we have a why. Without a "why," we are simply adrift in the world, and at best find some measure of satisfaction through distraction and entertainment. But that is not living deeply, and a life without felt meaning ultimately leads to neurosis and depression. I, along with many others, agree with Frankl. I think we desire meaning more than comfort. I think the sense that our actions have real significance is a fundamental need of humanity. But, if we truly do need some sense of significance, where does it come from? One option, probably the most popular in modern society, is the idea that meaning is fundamentally a human construct that we have the ability to superimpose on reality. That is, we create our own meaning in the world. We give ourselves a why. It seems to me that without invoking some type of spiritual reality (i.e. God, a meaning-giver, etc. ), if we want to hold on to some type of concept of meaning, this is what we are left with. "My main purpose in life is to drink soda." "My main purpose in life is to raise my son well." If I'm just creating my own meaning in the world, either one of these is equally valid. It's my choice. But one of these statements intuitively feels more correct. If I had a son and subordinated raising him well to my soda habit, most people would say something is drastically wrong. Most would say that I'd be missing out on a life filled with more meaning (giving my best energies to raising my son), for one with less meaning (drinking soda). Another way to think about meaning is the idea that it is something we discover. That it is an inherent part of reality, an actual part of the universe that we find. This, it seems to me, gives the concept of meaning some actual weight, some depth. Meaning becomes real and not simply a product of our minds. And I think the only way to leave this idea open as an option is to invoke some type of spiritual worldview. Frankl was mostly concerned with helping people find meaning in their own lives and circumstances. And that's, mostly, what we need. The abstract question "What's the meaning of life?" is less important than the question "What's my meaning in life?". But, as Frankl seems to say, if there is such a thing as my meaning, it seems that it must be a function of the meaning of life. Frankl calls this ultimate meaning of life its "super-meaning." For Frankl, the super-meaning will be forever beyond our grasp as finite humans. Our task is not to bear the meaninglessness of life, but to bear the fact that we can't fully understand its ultimate meaning. 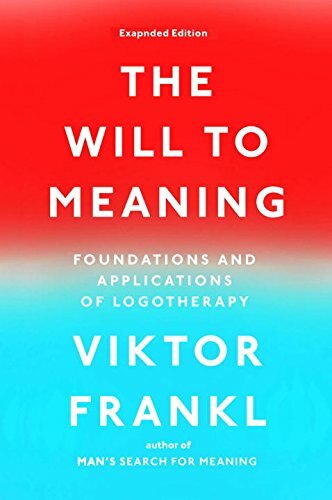 "This ultimate meaning necessarily exceeds and surpasses the finite intellectual capacities of man; in logotherapy, we speak in this context of a super-meaning. What is demanded of man is not, as some existential philosophers teach, to endure the meaninglessness of life, but rather to bear his incapacity to grasp its unconditional meaningfulness in rational terms. Logos is deeper than logic." The idea that there is a "super-meaning" – an Ultimate Meaning of Life – even if we can't fully understand it, seems to allow us to hold that the meanings we find in our own lives are an actual part of reality and not merely a creation of our imaginations.